An excellent choice for younger kings and those wishing for a blade better suited in confined spaces, this Excalibur LARP Short Sword displays a disc pommel and a bold fuller that extends down half the length of the latex blade. Crafted from dense latex foam with a unique fiberglass fusion core, this medieval LARP sword is lightweight and extremely flexible. The durable latex construction with painted details provides a realistic look for any cosplay or theatrical production. The black hilt, decorated with crosses and other designs, provides a regal contrast with the metallic silver blade. 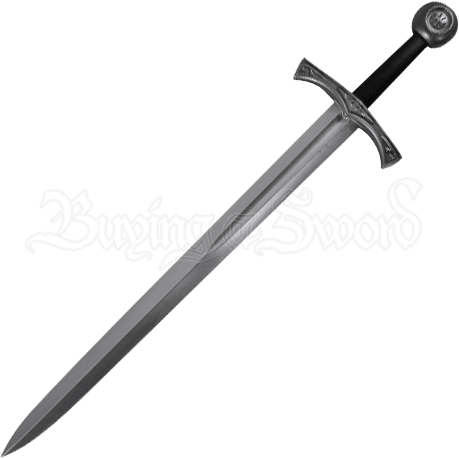 An excellent piece to wear to a Renaissance fair or Halloween party, this Excalibur LARP Short Sword is suitable for light sparring.